Adam make the leap to a three‑way speaker design that seems to pay dividends in clarity and separation. The motto at Adam Audio seems to be that if it ain't broke, see if you can fix it anyway! They've already established a strong reputation based on monitor speakers that incorporate their proprietary ART (Accelerated Ribbon Technology) folded-ribbon tweeter, but when we went to look in on them at a major trade show some months ago, we saw that many of the familiar models had been radically redesigned, taking on a mid‑range driver along the way. Compact three‑way monitors are unusual, and present a number of design challenges, not least the managing of two crossover points rather than one, so I was more than interested to see how these new models compared with the earlier two‑way designs. Outwardly, the S3XV looks distinctively Adam, with its black cabinet and 'stealth aircraft' chamfered edges. The main body of the box is covered with a matte‑plastic foil, and the heavy baffle (which is around 25mm thick) is finished in a satin black paint. This model measures 485 x 281 x 295mm, weighs 15.4kg, and is intended for both nearfield and mid‑field operation. There are two bass ports cut into the front baffle, and the drivers are mounted directly into recesses machined into the baffle. 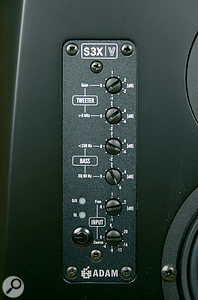 A standard, balanced XLR connector on the rear panel is used to hook up the audio input, and power is supplied via a switched IEC mains socket. No other connections or controls are located on the rear panel, but there's a covered slot for an expansion card (more later). The S3XV employs Adam's newly developed, four‑inch, Hexacone mid-range cone driver with a 25mm voice coil, plus a nine‑inch Hexacone woofer with a 50mm voice coil. An updated 'X‑ART' folded ribbon tweeter handles the high frequencies. The benefits of the folded ribbon design have been explained in greater detail in earlier SOS Adam speaker reviews, but, essentially, their folded, concertina‑like construction allows the ribbon to move significantly more air than a conventional flat ribbon for a given aperture size, while its low mass means that it is able to operate up to very high frequencies when compared with a moving-coil tweeter. Traditional ribbon tweeters can also be quite fragile, but Adam back these monitors with a five-year warranty — so they clearly have confidence in the longevity of their components. Hexacone woofer‑cone construction has been used in previous Adam models, and comprises a Nomex honeycomb sandwiched between layers of Kevlar, to combine stiffness with light weight — which, in theory, equates to low distortion and good transient handling. This adherence to folded‑ribbon tweeters and Hexacone driver construction, the latter now also used in the mid-range, suggests that the new model is an evolutionary move, rather than a 'from the ground up' reinvention of the company's monitor-speaker concept. The rear panel is kept simple, hosting only the IEC power inlet, the analogue audio input, and a blanking panel for the optional digital input. A generous amount of amplifier power is available, with the woofer driven by 250W (350W peak), the mid-range by a similarly rated amplifier, and the tweeter by a 50W (100W peak) design. The two high‑powered amps are Class D PWM (Pulse Width Modulation) amplifiers, which makes them very efficient and cool‑running, while the tweeter uses a more conventional class A/B analogue design. A frequency response of 32Hz to 50kHz is quoted with a deviance of ±3dB, which ably demonstrates the extended upper reach of the ribbon tweeter. The active crossover frequencies are set at 350Hz and 2.8kHz, although no details on the crossover slopes are provided. The maximum SPL is rated at 124dB peak, or 114dB short duration. Adam's literature claims that the S3XV is capable of producing more power and volume than their smaller speakers, along with a very detailed but non‑fatiguing sound. These are laudable goals, because studio monitors must be able to reveal subtle detail in a complex mix, but at the same time they need to be comfortable to work with for long periods of time. An optional digital input module can be retrofitted by the user, installed in place of that rear expansion-port cover I mentioned earlier. 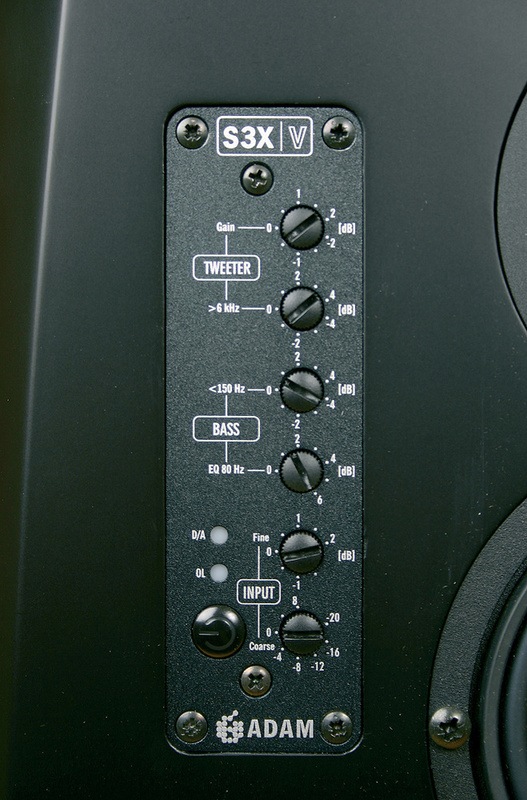 This is a 24‑bit/192kHz D‑A converter fitted with both AES/EBU (XLR) and S/PDIF (RCA Phono) inputs, as well as a Right/Left/Mono switch to determine which channel or channels the speaker should receive. A front‑panel status LED lights up in blue when this is fitted, although the card wasn't supplied with the review system. Magnetic driver shielding is also optional — and is arguably less necessary now than when CRT monitors were in popular use. A notable feature of the design is the front‑mounted control panel, which makes adjustment easier than groping around the back of the speaker with a torch! In addition to the power standby button, there are six rotary, slot‑headed controls. Two of them are dedicated to setting the input sensitivity, one for coarse adjustment over a ‑20dB to +8dB range, and the other for fine adjustment in half-dB stages, from ‑1.5dB to 2dB. The power button shows yellow when in standby, and green when pressed to bring the speakers on-line. Two further controls address the low‑frequency performance of the monitor, which is important, because the LF performance will vary according to the position of the speaker relative to room boundaries and corners. One control simply provides an 80Hz bass boost that's adjustable to suit the listening tastes of the engineer. The second is a shelving filter (±4dB) that allows the engineer to adjust the level of frequencies below 150Hz, where room boundaries have the most effect. At the HF end, there's an HF level control that's used to adjust the level of signals fed to the tweeter over the range ‑2dB to +2dB, again mainly to suit listening tastes, while the second is a shelving filter affecting frequencies above 6kHz, with a ±4dB range. LEDs are fitted to indicate overload and the presence of the digital input card. Part of Adam's design philosophy seems to be to keep the controls on the front, where they're more accessible. Here you can see the controls used to adjust the input gain, and to tweak the voicing of the speakers to suit their position and the room. Once monitors climb into this rarefied price range, they really need to do something special to justify their existence, as they're up against some impressive competition. After a fair bit of listening to both acoustic and pop material, and also doing comparisons with the recently‑reviewed Event Opals (which, although a little less costly, I'd still consider to be in the same kind of price sector), I found the S3XVs to have a very 'present' sound — by which I mean that the sound sources seem closer to the listener, somehow, than for most other monitors I've used. The stereo imaging is excellent, and the mid‑range drivers definitely enhance the mid‑range clarity, making vocals really precise and improving the separation between instruments. There's a real warmth and three‑dimensionality to the mid-range, reminiscent of the likes of ATC and PMC. That ribbon tweeter brings out the detail in a spectacular way, although at the normal 'flat' panel settings I found the monitors to be a hint too dominating for my liking in my own room: tweaking the tweeter level down a notch and also dropping the shelving filter one click produced a sound that I found more comfortable. Compared with the Opals, the low end has a somewhat different character that I felt was maybe a little less tightly controlled, but I have to admit that this falls more into the realms of taste than science, and there's certainly enough bass extension to allow them to be used with confidence even without a sub. It's also worth mentioning that the sweet spot for these speakers is unusually wide, so you can move your listening position quite a lot without compromising the sound. Solo acoustic guitar recordings really sparkle, with a good balance of depth and definition, while pop mixes take on a credible front‑to‑back perspective, as well as stereo width. These speakers have an almost forensic ability to pick out elements within a busy mix — and, most importantly of all, good mixes sound good and bad ones still sound bad. 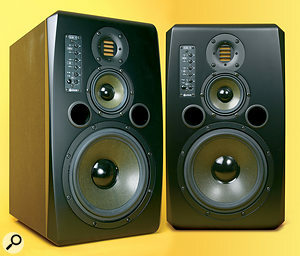 Having reviewed many speakers over the years, it still always surprises me that monitors can sound so different, even really good ones, yet your ears adapt to them very quickly, almost recalibrating your senses. Both deliver a version of the truth viewed from slightly different angles, so it has to come down to whether or not you make great mixes on these speakers, and whether you can comfortably work with them for long periods. Once I'd tweaked the front-panel settings slightly to suit my own taste, I felt very comfortable with the S3XVs, and they made me feel quite confident about what I was hearing. The more I used them the more I liked them, and I think it would be fair to say that they're the best sounding Adam monitors I've reviewed so far, particularly because of that open and detailed mid‑range. The sound of these speaker reminded me of PMC and ATC monitors of a similar size, and although there are other speakers in the same price range, I think these two alternatives come the closest in sound. Wonderfully detailed, with an exceptionally transparent mid‑range. Comprehensive panel adjustments for tailoring tonal balance. 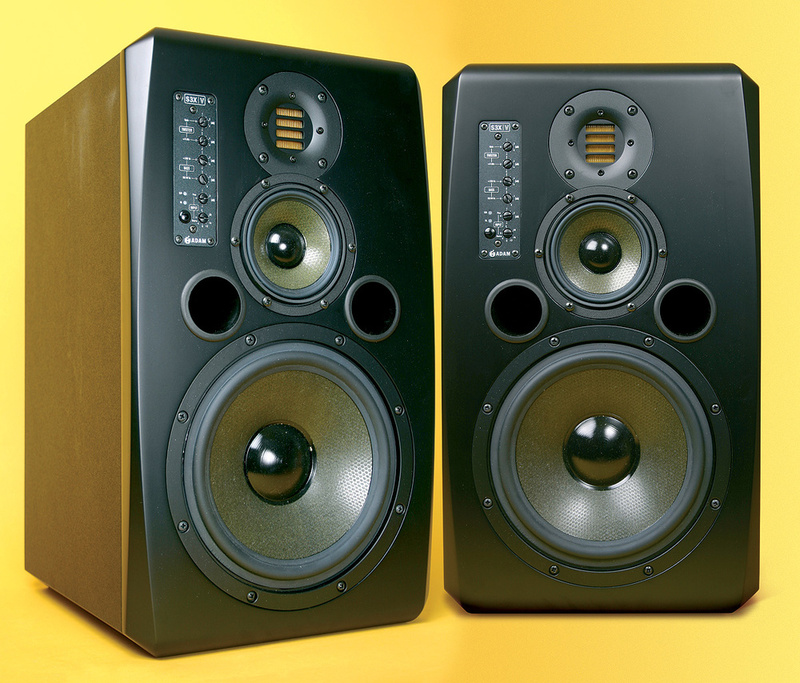 The S3XVs are very fine monitors capable of delivering good mixes, but they're priced above the range of most project studios. The addition of a mid‑range driver has really opened up the sound and enhanced the three‑dimensional aspect of the listening experience. £3500 per pair including VAT. 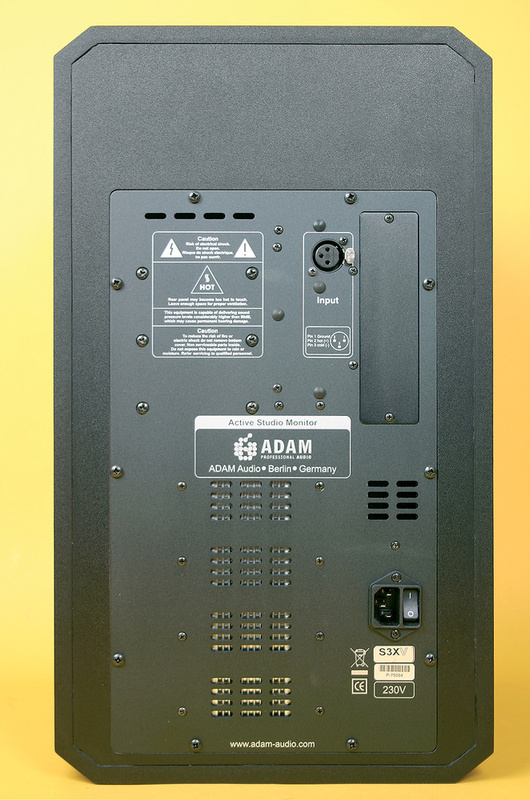 Adam Audio UK +44 (0)1992 525670. 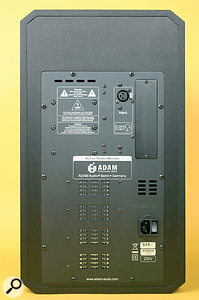 Adam Audio USA +1 516 503 1950.